Looking back on our mini-conference, we can now see better that the session titles clearly reflected the content, which indicates how much effort and work went into the preparation of each and every one of them. The notes we kept during the sessions using the tool David Mearns introduced prior to his session, todaysmeet.com, and the feedback from the participants all reflect a high level of interest and satisfaction regarding the event. We also have our own reflections on this refreshing mini-conference and perspectives from our roving reporters, Alicia Naomi Arabaciyan & Hatice Sarıgül Aydoğan. Here are the impressions of the Online Learning Support Team members. Day 1 sessions by David Mearns & Işıl Boy. David Mearns’s session, “Don’t Shy Away from ICT Resources, only, Adopt & Adapt”, was so energetically and clearly presented that even the novice computer users could take away something from it, although the session abstract said the session was not for such novices. Mearns’s session was innovative in the sense that he asked his teaching & project partner colleague, Brentson Ramsey, to accompany him, which was a nice surprise for us. Brentson actively participated in the session by monitoring the “todaysmeet?”entries by all the participants. The session emphasized how common technology use is among kids by questioning the amount of time invested in the educational use of tools, which also means the development of lifetime technology skills. David questioned the concept of “digital natives”, making a very valid point that learners mostly use technology for their personal needs and fun. This is why he underlined the importance of guiding the learners each time the task requires them to use a certain technological tool or platform and setting ground rules both on the procedure and time management. He also drew the audience’s attention on how important it is to allow learners to personalize the topic. “Chattinar”, which David and Brentson set up, provided a good sample of a desirable learning environment which David described throughout his inspiring session. The tools David introduced ranged from a high-resolution image to Microsoft ppt templates, 500 pics, Edmodo, Tildee-video writing, Penzu, the flipsnack.com “Time frame of your life” activity and SPRE. Here are some ?todaysmeet? entry samples to reflect the session. It looks like all these different tech tools have a short expiry date in terms of arousing student interest. David Mearns (by Alicia Arabaciyan) gave a highly-energetic presentation on a chock-full of applications and websites teachers can access to engage 21st-century students in the classroom and beyond. Steering clear of such terms as “digital natives” (an inapplicable term according to David) students even in the current classrooms are still very limited in terms of which programs, software and websites they are comfortable and familiar with. 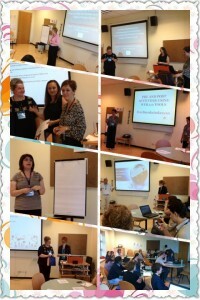 So, if you are ready to venture beyond Facebook and Powerpoint, this was the workshop for you! One final piece of professional advice from David: GET ON TWITTER! Thanks to David Mearns for sharing his slides with us. Işıl Boy’s session, “Digital Cocktail Recipe: ½ shot of VLE, ½ shot of PLE, layer theories on top and serve with digital story cakes”, started off by questioning what key concepts session participants had in mind regarding the use of technology. She introduced the concept of “user-friendliness” as a key focus while selecting the tools and platforms to be integrated into teaching. The participants could get the unique taste of each ingredient in her “digital cocktail” as the time allocated to cover each tool and platform was just right and the examples from her own teaching and research gave the audience clear ideas on how to design their own class tasks. The theory and practice were well-balanced, which kept the audience involved throughout the session. The e-book on Wiki problems & solutions written by Işıl Boy as part of her MA studies aroused interest among the audience. Işıl Boy (by Alicia Arabaciyan) presented a lovely “digital cocktail recipe” in all its parts. 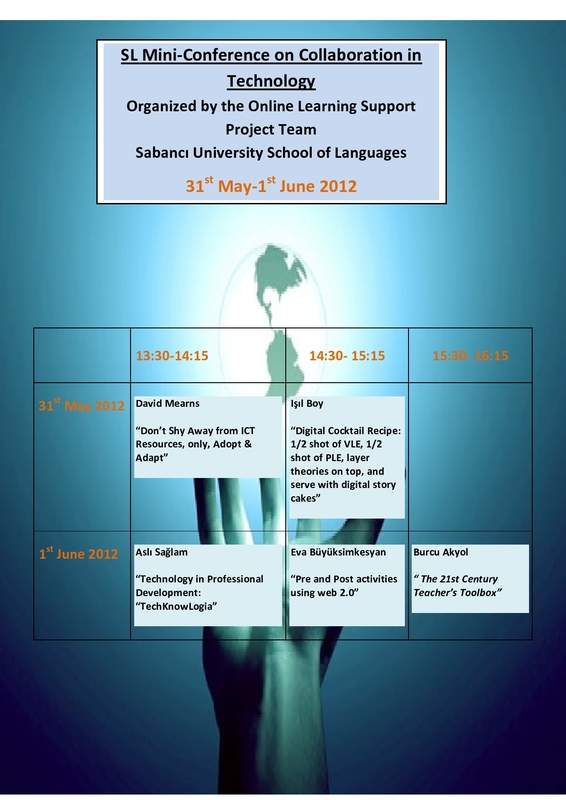 Ingredients included such items as VLE vs PLE (if you do not know these, refer to her slides a.s.a.p!). Basically, she breaks it down for educators in particular, to introduce or revisit the differences between virtual learning environment and personal learning environment. This presentation was an excellent reminder of the uses and effectiveness of both arenas without having to eliminate either. Rather, Işıl offered another chock-full of online options to be utilized by both teachers and students, confirming their effectiveness via her research and field experience. A key point made was to always keep in mind “user-friendly” importance when choosing online resources and other technology to be used in the classrooms. So many options, so grateful to this presenter as well. Thanks to Işıl Boy for sharing her slides with us. 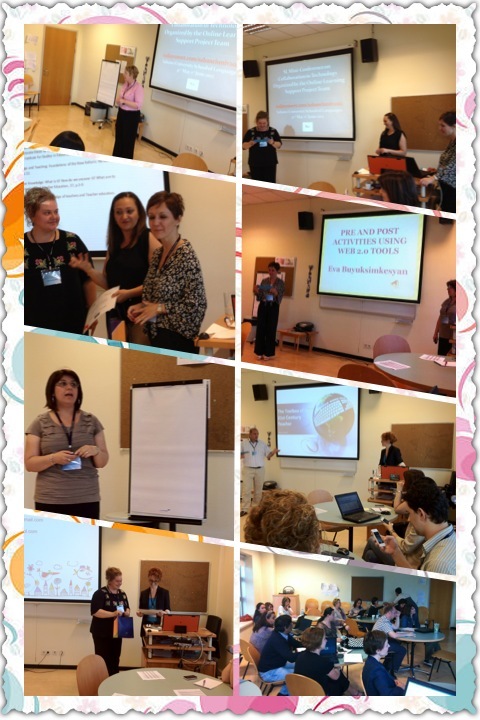 Aslı Sağlam’s session, “Technology in Professional Development: ?”TechKnowLogia” was very well staged. The audience could follow the theoretical and practical aspects of the content easily with Aslı Sağlam’s professional guidance. She also shared some tools which allowed participants to reflect on their own perspectives and use of technology. The session examined the role of educational technology as well as looking into the interaction between digital technologies and, as Aslı Sağlam puts it, “the development of teachers” vision for education. It also explored the potential of technology in fostering teachers’ motivation to learn and to grow professionally. As was suggested in the session abstract, a good selection of various online communities and web applications that may assist teachers to learn with digital technologies was showcased. The session mostly focused on the idea of “teachers’ learning in the community”, which appears to be the driving force for the teachers who wish to enrich their own resources and potential in educational technology. This idea was received as inspirational and left the audience with a good amount of food for thought. Aslı Sağlam (by Hatice Sarıgül Aydoğan) gave a very inspiring session. She hit it off with what type of knowledge we thought was most essential for teachers and expressed her belief that to be able to use technology wisely we need to have Technological Pedagogical Content Knowledge (TPCK) which basically means that neither knowing content, pedagogy, nor technology on their own would be sufficient; we need to know the content matter and how to use technology in order to achieve our pedagogical objectives in line with pedagogical principles. Then she went on to introduce a range of tools including Voxopop (an online discussion group), EVO (Electronic Village Online) which includes many videos, Teacher bootcamp, Scoop-it, and Just the Word. All of these tools seem worth checking out, but one of these stands out in that it may help people get started with Web 2.0 tools, the “Teacher Challenge Edublog” which neatly scaffolds the learning / using of a myriad of web 2.0 tools, walks one through bitesize steps and provides activities that students can be asked to do. Especially if you’re keen on using blogs in class it might be worth checking it out ? even if you have experience using blogs there might be some new aspects to incorporate;-) Thanks a lot to Aslı for such an energetic and enthusiastic session with so much to take away. Thanks to Aslı Sağlam for sharing her slides with us. Eva Büyüksimkeşyan’s session, “Pre and Post activities using web 2.0”, which emphasized the fact that ?use of Web2.0 tools enables its users to reach a real audience?, gave the participants a clear insight into the most effective way to motivate learners to actively do the pre and post activities. That is, the sense of having a “real audience”, the need to make oneself visible, can encourage learners to take it all more seriously to the extent that even the ones who may shy away from in-class activities which do not require the use of Web 2.0 tools, may feel the comfort of having their own space offered by the so-called tools. The pre and post tasks Eva Büyüksimkeşyan shared with the participants outlined clearly how the presenter herself explores them with her learners. The students, as a response to active use of class blogs, reported that “it was really nice to be talking to others via blogs”. The selection of the tools introduced was based on ease of use, which encouraged most of the participants to give it a try. As Büyüksimkeşyan puts it, ” Pre and post activities are very important in the teaching process as they prepare the students for the lesson and lead them to produce the target language”, which proved to be exactly the case looking at the overall content of the session, which included impressive samples from the presenter’s own teaching experience. Towards the end of the session, everyone started talking about wanting to be a student in Eva’s class. Her session kept all the participants alert and inspired from the start to the very end. Here are “todaysmeet” entry samples to reflect the session. Eva Büyüksimkeşyan (by Hatice Sarıgül Aydoğan) gave a session on Pre & Post activities using Web 2.0 tools, which was very resourceful. She provided an overview of the tools she uses and recommends, before moving on to share some concrete examples of how she and her students have made use of those. Some of the tools she introduced were Photopeach, Searchstories, Glogster, Tabblo, Wallwisher, Domogoanimate, Voicethread and others: a nice range of tools that can be employed for many different purposes, engaging students and having them produce language. It was pleasant to remember some of these tools that had gotten forgotten somewhere down the line, as well as being offered a few new ones. Thanks to Eva Büyüksimkeşyan for sharing her slides with us. Burcu Akyol’s session,” The 21st Century Teacher’s Toolbox” suggested that “21st century teachers need to be fluent in emerging technologies and harness the power of ICT to enhance their productivity and professional practice and maximize student learning”, as is mentioned in the session abstract. Burcu Akyol initially shared her own experience with blogging and Twitter and gave insights to the participants whose proximity to actively using Twitter varied. She then looked at a variety of Web 2.0 tools by showing samples from her own blogs and guided the audience on how to examine the classroom fit and impact on teaching and learning. Her slides left the audience with slogans to think about. The one with the shark vs blogging analogy made an especially valid point by pointing out that both sharks and blogs need to keep going, otherwise they will die. The presenter also welcomed questions from the audience on how to organize personal and business networks using social media tools. The session overall provided evidence on the importance of “the magic of sharing” and being an active blogger and Twitter user to enhance sharing among educators. Some of the tools the presenter introduced include linoit.com, mentimeter.com, and Wallwisher. Burcu Akyol (by Hatice Sarıgül Aydoğan) offered a rather more detailed session, focusing on two main tools of the 21st century, namely blogs and tweets. She gave a detailed introduction to the world of blogging, distinguishing teacher blogs from individual student blogs and class blogs. It was a very effective lead into the practice of blogging for people who might not be using it already. She also shared some of her class blogs and emphasized how happy she was with what the students have produced on these blogs. She then went on to stress the importance of Twitter in keeping up to date on EFL matters and to create a professional network. Before finishing, she also briefly introduced Scoop it, Lino it and Mentimeter (a quick poll tool). Special thanks to Deniz Kurtoğlu Eken, SL Director for her invaluable support, which made this mini-conference possible. Each day started off with a nice introductory speech by Jacqueline Einer, SL Program Coordinator. Thanks to her for her constant support. A giant thanks to the presenters, Aslı Sağlam, Burcu Akyol, David Mearns, Eva Büyüksimkeşyan & Işıl Boy, without whose voluntary participation this mini-conference would have been nothing but a dream. A heart-felt thanks to the roving reporters Alicia Naomi Arabaciyan & Hatice Sarıgül Aydoğan. Thanks to our colleague, M. Şila Yosulçay, for introducing David Mearns, our first presenter. Another thanks to our colleague Ahmed El-Mahi for being the event DJ. 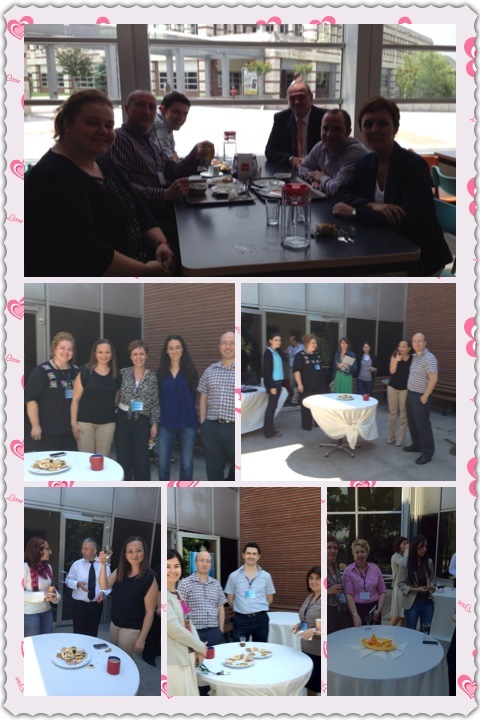 Thanks to the SL Admin office team members, Ebru Özgür Katioğlu, Senem Acabay, Aslı Tuan Acer & Ayşegül Abut for all their hard work behind the scenes. 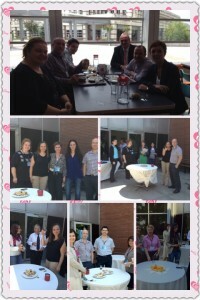 Many thanks to Erdal Türk for the stimulating food & drinks service. Sabanci University Gift Shop, Pearson & Longman for being our raffle sponsors. 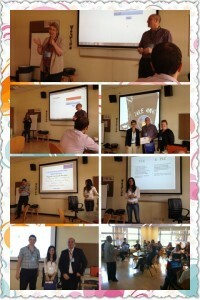 This mini-conference, we believe, was “creating and developing together” come true. 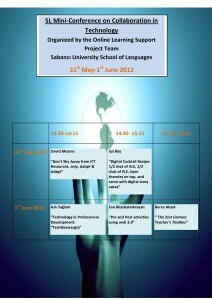 Looking forward to welcoming you all at another “SL Mini-Conference on Collaboration in Technology”.